Custom Content Builder enables you to create Microsoft Training content with multiple outputs of process, learning and support for any Microsoft application - providing an efficient and effective way to up-skill your employees on the features of any new or upgraded applications. Custom Content Builder can assist your organisation realise speed to competency, reduce training costs and broaden user acceptance; avoiding the usual drop in performance when new applications are released. In addition to enabling you to create your own Microsoft Training Content, Custom Content Builder offers a comprehensive library of customisable eLearning and Classroom content. Existing content titles include Microsoft Office 2003, Office 2007, Office 2010, Windows and Vista. Office 2010 alone, (encompassing Outlook, Word, Excel, PowerPoint and Access) comprises over 2,000 tasks which equates to more than 1,000 man days of development. All of this development work has been done for you! Offering a fully blended learning solution including eLearning via the web-based simulation, classroom material and quick reference cards. Microsoft Training Content can be easily customised to reflect your corporate branding, templates and other organisational requirements. 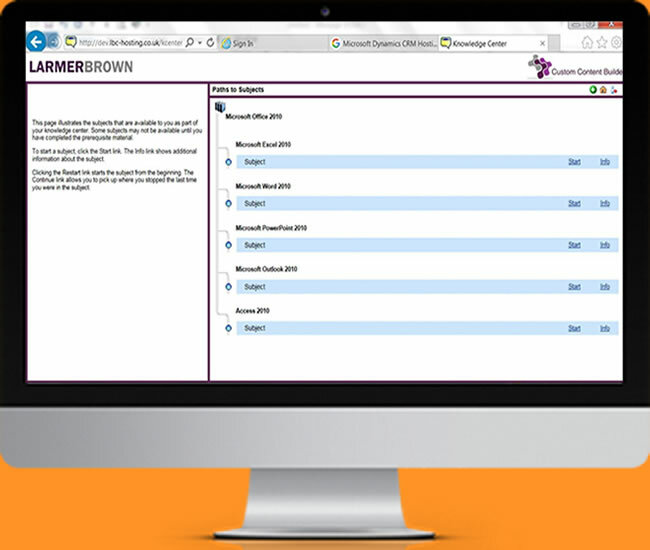 Questions and assessments are included within each topic to allow you to test Users on their understanding and competency. All user activity and achievement can be tracked and reported using Custom Content Builder. Alternatively, as all Content conforms to AICC and SCORM standards it can be imported into your LCMS or LMS to utilise its tracking and reporting features. Content is fully searchable by key word and jump in points. Users will require an End User Licence to access the Content using Custom Content Builder´s web-based browser. A Developer Licence is also required in order to edit the Content using Custom Content Builder Editor. Outright purchase via Perpetual License, plus optional Maintenance and Support. Annual Lease Agreements including Maintenance and Support. Managed Service hosted by Larmer Brown for either of the options above. Larmer Brown offers a Managed Solution that provides all the benefits you would expect for an inclusive monthly cost. This service can be adapted to suit your business requirements. A hosted learning portal tailored to reflect your corporate branding. Personal log-ins and learning content for each user. Third Party Content can be imported into the Custom Content Builder Library. Customised tracking and reporting of user activity and achievement. Whether you choose to purchase Custom Content Builder outright and deploy yourselves or utilise our Managed Solution, we offer a selection of services to support your implementation.